Interhost Review 2019: Is Interhost a Good Hosting? Israeli web hosting provider Interhost offers a good 99.99% uptime guarantee, but you have to pay the price for such stability. Israeli hosting provider Interhost was founded in 2015. It offers dedicated server hosting, managed server hosting, colocation, and website hosting with a 99.99% uptime guarantee and free SSL. Interhost uses a Tier 1 data center in Israel, and also a data center in Europe for some of its hosting. 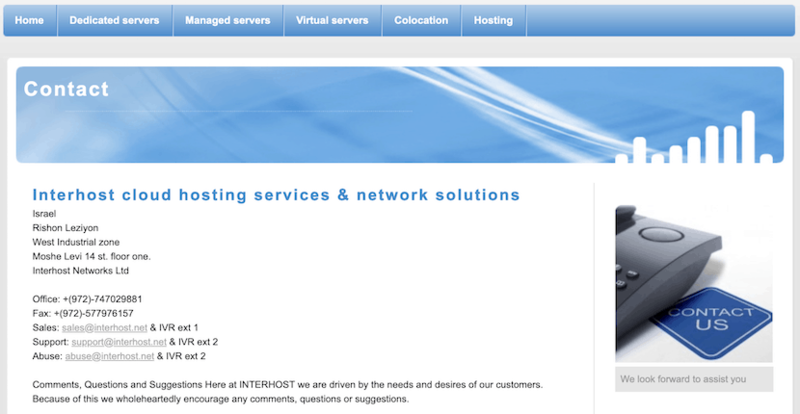 The Interhost website can be switched between English and Hebrew. The Windows hosting plans range from Starter to Expert, with the Starter plan featuring 350 MB of storage, 20 GB of monthly traffic, unlimited POP3 email accounts, and unlimited MySQL databases. Each Windows plan also includes hosting for just one domain, a shared SSL certificate, and the Plesk control panel. MSSQL databases are available for an extra monthly fee. The four Linux hosting plans start with the Soho plan that provides 250 MB of storage, 40 GB of monthly traffic, two MySQL databases, and five email accounts. Interhost is able to provide a very stable 99.99% uptime guarantee, and customers are refunded 5% of the monthly fee for every 30 minutes of downtime. The high uptime is achieved in part thanks to redundant connections to multiple 10 Gbit data providers. Interhost also uses Cisco routers and Juniper firewall hardware, and a connection rate of 5 Gbps is achieved via Gigabit connections to five separate carriers. Servers are monitored 24/7/365 by professional engineering staff. Interhost’s prices are higher than its Israeli and international competitors. The entry-level Linux and Windows website hosting costs between 50% and 400% more than rival plans with similar data levels. Storage is on the low side and is far less than what many providers offer with their entry-level plans. Hosting can be purchased monthly, quarterly, semi-annually, or annually, and you get discounts for longer commitments as follows: 3% discount for quarterly payments, 5% discount for semi-annual billing, and 10% discount for an annual plan. Customers can access 24/7 support in English, Hebrew, and Russian via email, ticket system, or telephone. Unfortunately, I received no response to my sales query. Interhost offers Linux and Windows shared and dedicated hosting. For its higher-than-average 99.99% uptime guarantee, you have to pay a higher-than-average price. I’d feel better about this provider if it had responded to my initial approach. 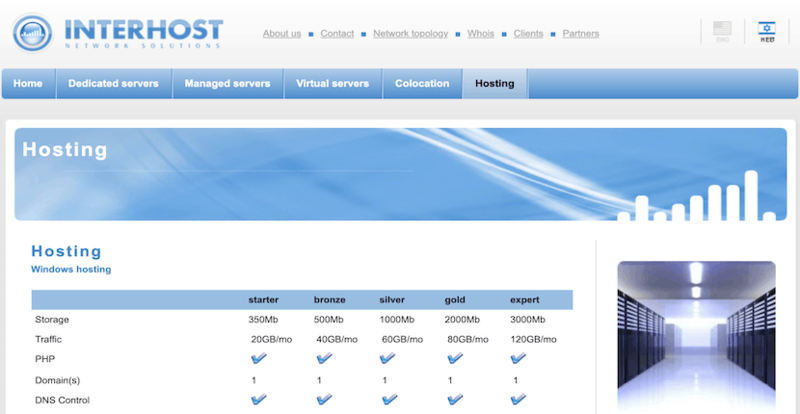 Sign up for stable Israeli hosting with Interhost. Wondering how Interhost stacks up against other Web Hosting companies? Enter any other Web Hosting company and we will give you a side-by-side comparison.